A glimpse at Apple's refreshed online store. 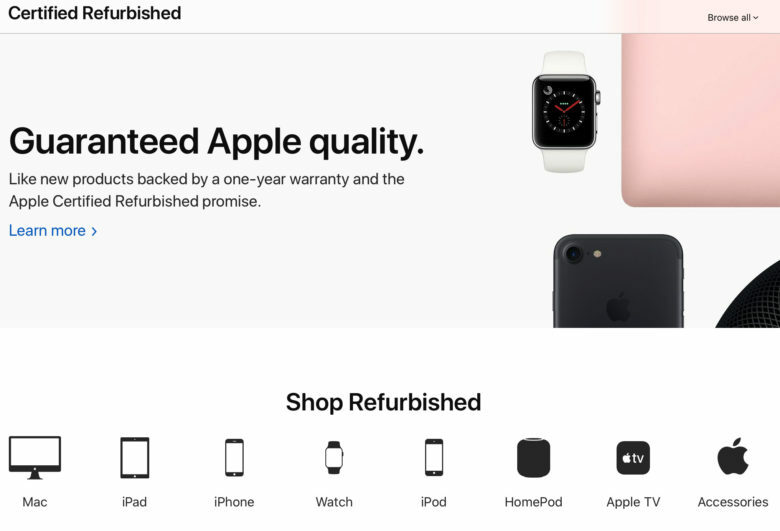 Apple has debuted a new look for its Certified Refurbished Online Store, giving it bigger pictures and easier navigation options. Previously, Apple’s Certified Refurbished was nothing special, potentially since Apple was hoping that you would skip over it and buy the new, full-priced items. Now it’s changed it mind — with a new design that places a bigger focus on this part of Apple’s retail business. Apple’s refurbished products are usually available shortly after a product has launched, as customers trade in their devices. These are then given an Apple-approved polish, hopefully taking them back a state comparable with a new device. Each refurbished product comes with a one year warranty. Apple’s refreshed Certified Refurbished Online Store comes at an interesting time for the company. Recently, Apple confirmed that the T2 chip found in new Macs will only allow Apple or officially sanctioned Apple repair shops to carry out repairs. This is due to software locks meaning that repairers need Apple’s proprietary diagnostic software, called the AST 2 System Configuration. Apple has also signed a new deal with Amazon that could prove extremely damaging to third-party sellers of new or repaired devices — many of whom sell devices for lower prices than Apple. As such, while we’re certainly glad to see Apple’s Certified Refurbished Online Store get an upgrade, we can’t help but think it’s a double-edged sword.